Pretty much doing some early Spring cleaning around here at LifeIntrigued. I have a bunch of processed pictures sitting in the queue I want to get through as soon as possible. Not that there is anything wrong with them, I’m just getting really antsy to get to all the trips we’ve taken since these were taken. The good news is this set of shots is more recent than all the Yellowstone posts from May 2013 you’ve been reading for the last couple of months. To quantify the liberal use of “recent” these pictures were taken in .. wait for it … July of 2013. WOOT! Hit the jump to see some more interesting birds! Those familiar with Yellowstone, will immediately detect this set of pictures was NOT taken in that Western region. Nope, these shots were actually taken in Baraboo, Wisconsin. Still a strange place to be seeing such magnificent birds. 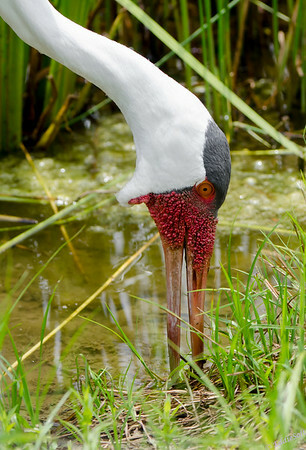 This particular exotic bird is a Wattled Crane. When not hanging out in Illinois’ playground, they call eleven sub-Saharan countries in Africa their birthplace. And then there is this pretty carrier for a cranium called a Black-Necked Crane. Like the one before it, this bird is also a “visitor” to the Baraboo region hailing from China and nearby India regions. 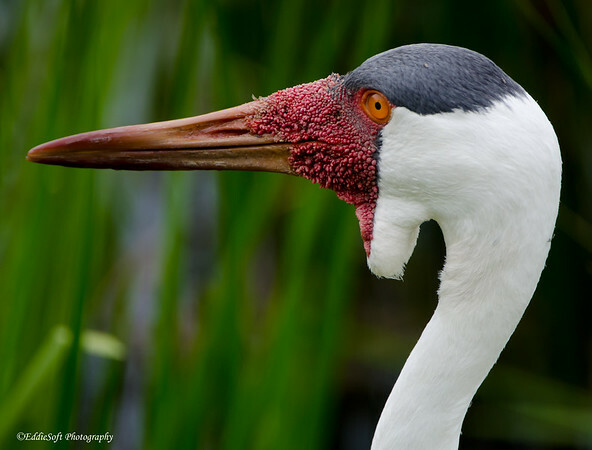 The closest we come to native birds in our region that can compete with these gorgeous birds are Sandhill Cranes. Oh, I should point out the element shot at the top of this page is a section of the Black-Necked silver grey body feathering. The reduced shot doesn’t really do justice to the intriguing detail in the composition. Before going further, I should admit that these birds were not taken in the wild. 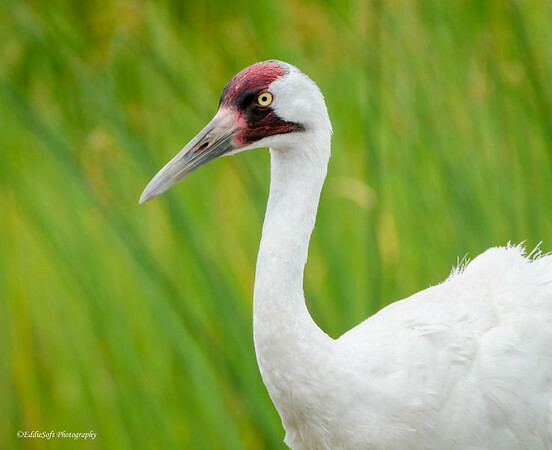 Baraboo is home to the International Crane Foundation of which Linda and I are proud members. This foundation has been featured a number of times on this blog (link here). It has never failed to entertain us and we always come away with memorable shots in the tin. Of all the birds there.. this is the holy grail for me. 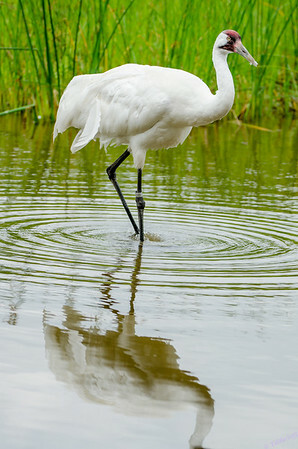 That is the Grus Americana or more commonly referred to as the Whooping Crane. 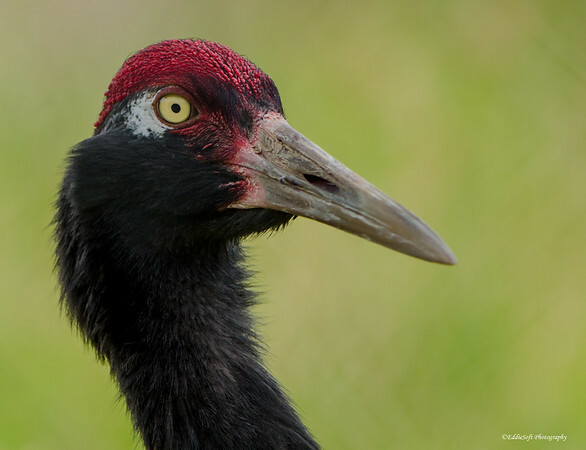 In addition to the Sandhill, this is the other Crane you can see in the wild without having to travel out of the country. Unfortunately, you will likely have to travel to one of only a few places that happens to include the Gulf Coast of Texas. 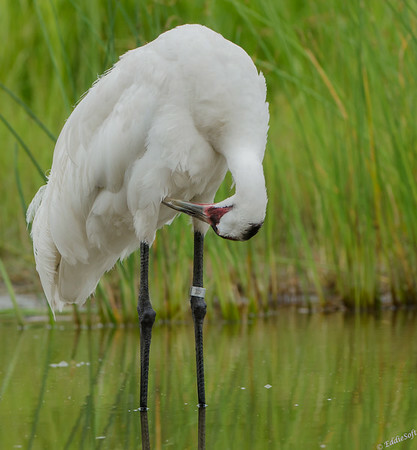 If you look at a region map for this bird you will basically see TWO dots – one in Canada for the Summer months and then another spot along the Gulf. 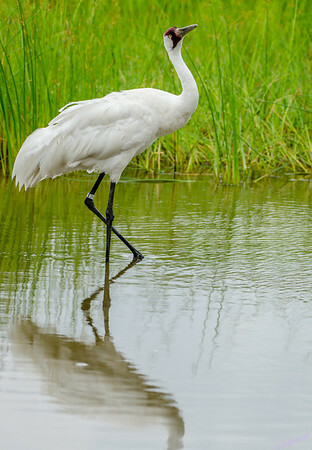 This is the tallest bird in North America and was … whoops I mean “is” on the top of my dream list. I almost left this shot out for one very key reason, but decided I liked the composition and maybe non-birders wouldn’t notice. It is actually blinking in the shot above – notice the eye coloring between the two previous shots. Quite a dramatic change in the latter from the true warm coloring of their pupils in the previous shot. 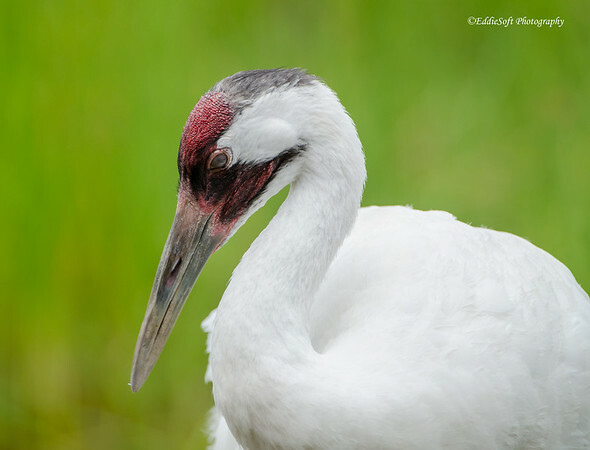 Think I might have mentioned this in the previous posts, but the ICF has a wonderful habitat for viewing the Whooping Crane. 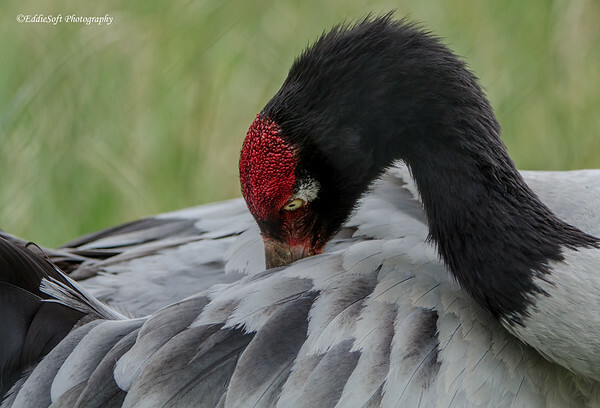 You can get super close to the cranes without any annoying fences – the bane of all photographers. They also have a whole seating area to relax the feet and simply sit back and enjoy being in the presence of a beautiful creature. These are just amazing photographs, even if they were captive birds! If those birds continue to avoid me, I’m going to have to make it up there. That feather texture in the first photograph is very unusual and very awesome. 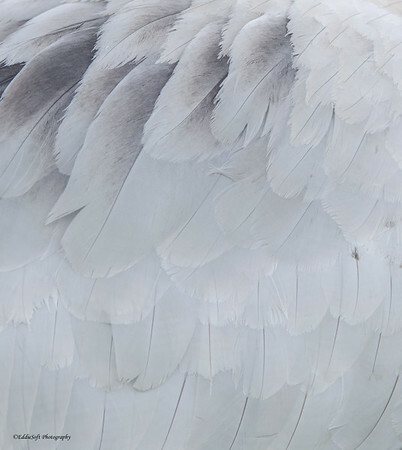 I think it would make a great background for the back cover of a book of your bird photographs where the bio text about your brother would be (make one, I already have your calendar up in my office at work!). I didn’t know they had African cranes at Baraboo. Those are cool as well. Do you realize what it takes to make a book (hehehe thought I’d just through that out at you). I will say that doing the EddieSoft Dog book about killed me – read, proofread and proofread again and again and still missed typos. To embark on that effort again will require heavy amount so alcohol. 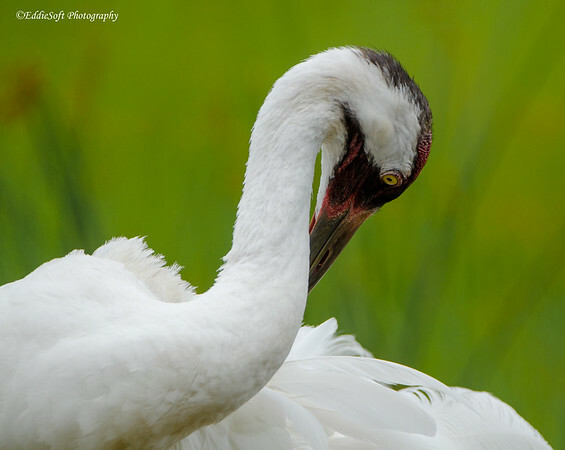 They have all kinds of Cranes at Baraboo – I tell everyone that goes up there to drop in. It is a true gem in the Illinois Vacation Playground.